Mobile Mark’s PN8-700/2100 is a LTE Directional Panel Antenna with a single-feed linearly polarized model. It offers 8 dBi gain, and covers 694-690 & 1710-2170 MHz. MobileMark antenna offers 8 dBi gain across the band with a maximum VSWR of 2:1. Mobile Mark’s panel antennas are excellent for deploying point-to-point and point-to-multipoint applications. This antenna is housed in attractive Vacuum Formed radomes. The PN8-700/2100 measures 8” (20.3 cm) wide by 12” (30.5 cm) tall and 5” (12.7cm) in diameter. Units can be added or removed as network deployments change. All models are supplied with heavy-duty adjustable pole mount brackets which accommodate pipes of up to 2 ½ (6.4 cm) inches in diameter. The mounting bracket hardware and all bolts are made from stainless steel. An adjustable tilt pole mounting bracket allows simple alignment. The mount contains a continuous adjustable tilt slot; the antenna can be adjusted up to 24o down tilt. All of the mounting hardware need for pole mounting is provided. MobileMark antennas are extremely rugged and dependable; and DC grounded external protection is recommended for lightning protection. The PN8 Series antennas are housed in attractive grey vacuum formed plastic. Single connector on the back of the single-feed model; two connectors on the bottom of the dual-feed model. Because these antennas are light and compact, moderate pole mounting configurations can be used for easy firstnet network deployment. 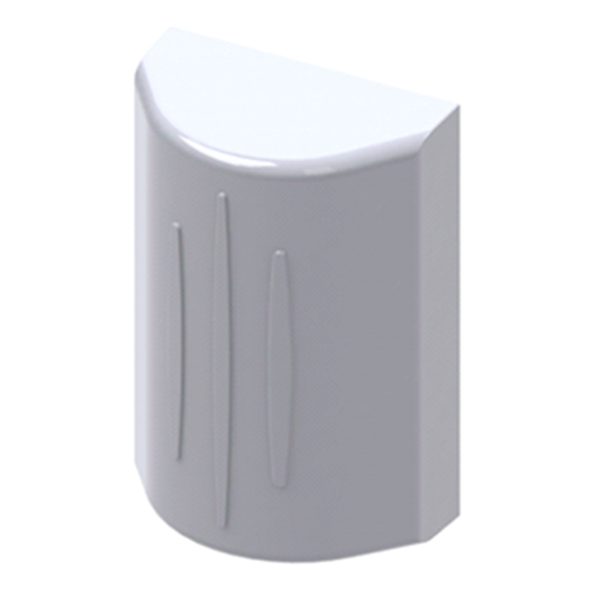 Compact and easy-to-install; complete mounting hardware provided with the antenna. PN8-700/2100D: The “D” model comes with 7/16 DIN termination. Compact and easy to install, complete mounting hardware is provided with the antenna. PN8-700/2100N: The “N” model comes with N Panel Jack Termination. Compact and easy to install, complete mounting hardware is provided with the antenna.